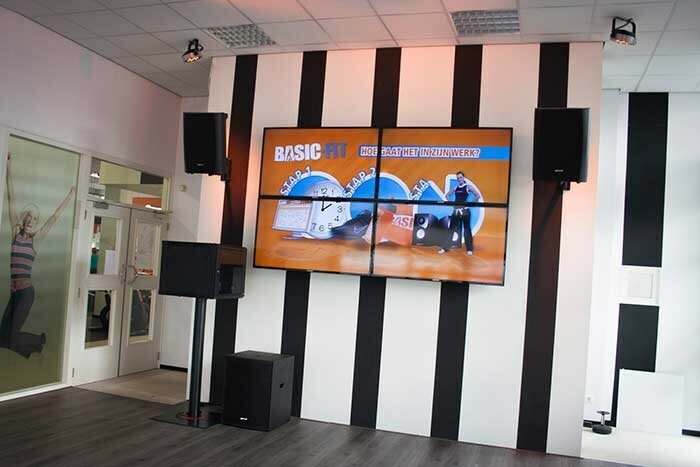 Over the last year Dutch based installer First Impression Audiovisueel was commissioned to supply an audio, video and lighting installation for Basic Fit. Basic Fit is a large chain of sport clubs located throughout the Netherlands and Belgium. First Impression found a perfect control solution in the CueCore solid-state control for this customer. The CueCore is a lighting controller for permanent installations manufactured by Dutch company Visual Productions BV. The device is completely solid-state, with no moving parts; it is an extremely secure and low-maintenance installation control solution that has only a minimal power consumption. All operating and programming is done through its dynamic web interface. In 170 locations of Basic Fit 'feature video walls' are now installed in the group lesson rooms. These feature video walls are made up from a combination of LED lights, speakers, narrowcasting players and HD LED Displays for the virtual fitness systems. For the control element the CueCore was selected by First Impression as it can receive UDP messages, has contact closures and is solid-state. The narrowcasting video player sends UDP messages to trigger cues programmed in the CueCore. In each location one CueCore has been installed. Each CueCore can be controlled locally by four buttons connected to the onboard GPI contact closures. The CueCores are also set up in a network so that the virtual fitness content can be managed, changed and controlled remotely from the Basic Fit head quarters. The CueCore has helped to enabled the feature video walls to become a perfect corporate communication channel for Basic Fit. The systems enable a completely new experience with lessons that can now be followed 24 hours a day, seven days a week. Therefore giving the Basic Fit members a significant added value and service which is now widely and enthusiastically being made use of. This solution insures that not only the Basic Fit corporate image and virtual fitness concept remains throughout, but also that all venues are supplied with new fitness content or members information at the same time.